QuickChek team members are once again aiding thousands of area families in need this holiday season. Thirty volunteers from QuickChek’s headquarters in Whitehouse Station, NJ and various stores sort and pack donated food at the Community Food Bank of New Jersey in Hillside on December 13, 2018, wrapping up a season of giving back to its communities and helping those in need. While the fresh convenience market chain supports area food banks throughout the metropolitan area all year long, recent efforts include donating 900 pounds of chili and 300 pounds of hot chocolate to the Franklin Township Food Bank in Somerset on December 3. QuickChek is also a campaign partner of the annual Check-Out Hunger fundraiser that takes place every autumn at most major supermarkets and convenience stores throughout the region, benefiting more than 30 Feeding America food banks and affiliates from New England to Florida. Shoppers at each of QuickChek’s 159 stores throughout New Jersey, New York’s Hudson Valley and Long Island have the opportunity to help feed hungry families in their communities by donating $1, $3 or $5 coupons at store check-out counters during a six-week period that began on November 3 and ends on December 15. A $1 donation helps provide 11 meals through the Feeding America network, which works with manufacturers and retailers across the country to secure safe, healthy food that would otherwise go to waste. QuickChek has raised $561,000 during the first four years it has been a campaign partner prior to this holiday season; this year’s campaign amount will be announced in January. All of the money raised benefits those in need within the counties in which QuickChek operates store locations. “Our continued partnership with the community food banks aligns with our mission of caring, of helping our neighbors in their time of need, and supporting our local communities where we have store locations,” said QuickChek CEO Dean Durling, whose family-owned company has been named one of the most generous in the state by New Jersey Monthly magazine. 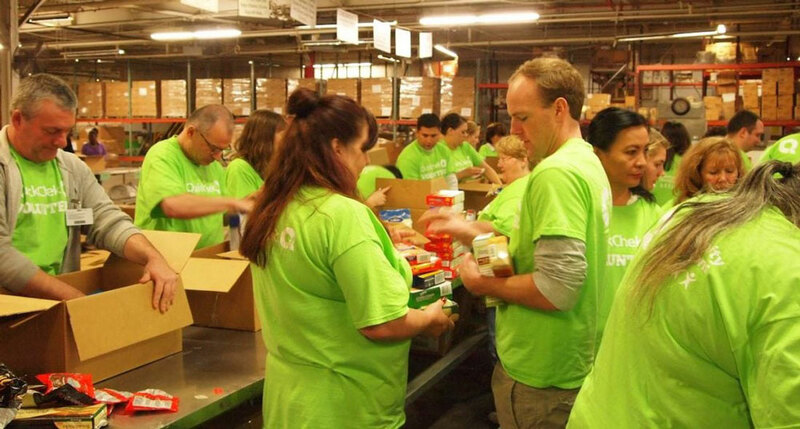 Durling noted that team members look forward to volunteering their time, such as their upcoming shift at the Community Food Bank of New Jersey, and actively supporting their communities throughout the year. Last year a team of QuickChek volunteers packed a whopping 868 pounds of frozen food during a two-hour shift that was distributed to area residents.